Dress rehearsal for Moon landing. First manned CSM/LM operations in cislunar and lunar environment; simulation of first lunar landing profile. In lunar orbit 61.6 hours, with 31 orbits. LM taken to within 15,243 m (50,000 ft) of lunar surface. First live color TV from space. LM ascent stage jettisoned in orbit. This dress rehearsal for a Moon landing brought Stafford and Cernan’s Lunar Module (LM)—nicknamed "Snoopy"—to within nine miles of the lunar surface. Except for that final stretch, the mission went exactly as a landing would have, both in space and on the ground, where Apollo’s extensive tracking and control network was put through a dry run. Shortly after leaving low Earth orbit, the LM and the Command/Service Module separated, then redocked, top to top. Upon reaching lunar orbit, they separated again. 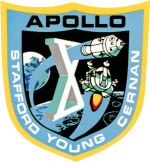 While Young orbited the Moon alone in his Command Module "Charlie Brown," Stafford and Cernan checked out the LM’s radar and ascent engine, rode out a momentary gyration in the lunar lander’s motion (due to a faulty switch setting), and surveyed the Apollo 11 landing site in the Sea of Tranquility. This test article of the LM was not equipped to land, however. Apollo 10 also added another first—broadcasting live color TV from space.